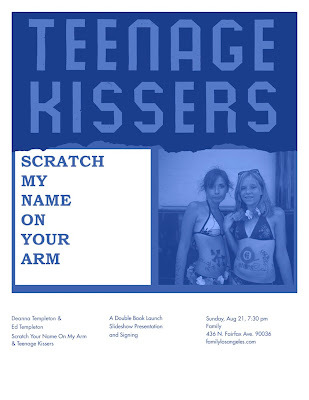 Family is pleased to present a double book launch, slideshow presentation, and signing by Deanna and Ed Templeton. For five years, Deanna Templeton has been photographing beachside congregations of kids in southern California: Scratch My Name on Your Arm documents a peculiar trend emerging in Californian youth culture where teens have a variety of brand logos stenciled on their bare skin, and have famous surfers and skaters autograph body parts. Teens using their bodies to communicate is nothing new, and using their skin relates to a self-expression that is almost tribe-like. Deanna Templeton's early influences were shaped by her involvement in the punk scene as well as going on tours with her husband and other professional skateboarders. Largely self-taught, in 2002 Templeton began making a series of self published 'zines called Blue Kitten Photos, and has since published the books, "Your Logo Here", and "17 Days". She has had solo shows at the Museum Het Domein (Netherlands), NRW Forum (Dusseldorf), and the Schucnk Museum (Netherlands). Ed Templeton is a painter, photographer, and former pro-skater. He has exhibited his artwork at the Palais de Tokyo, Paris, Museum Het Domein (Netherlands), and Kiasma Museum (Helsinki), as well as being part of the Beautiful Losers exhibition. In 2008 a book of Templeton's photographs, Deformer, was published in Italy and recently won first prize at the International Festival of Photography in Rome. In April of 2010 he will be having a mid-career survey exhibition of his work at the Museum of Contemporary Art in Gent (Belgium).